While volunteering at Blackberry Creek, Sophia Perkins kneels down in the dirt to hang out beside one of the pigs at the farm. Photo by Paige Alcala. What people consider to be “food” so often comes from animals, such as the countless egg dishes served at restaurants. However students rarely realize what happens to these animals. The chickens in the egg industry live out their short lives in small cages, usually fitting 5-10 birds each, before they are slaughtered after their reproduction systems wear out when they are only about a year and a half old. Danielle and Josh Hanosh founded Blackberry Creek Farm Animal Sanctuary to provide an opportunity for volunteers to work beside them to save animals from the mistreatment that occurs in the food industry. “The mission of Blackberry Creek is to provide a refuge for animals to live out their lives enjoying kindness, compassion and permanent sanctuary, and to provide opportunities for education to the general public,” Hanosh said. This organization’s slogan is “Love one another” and this represents how the Hanosh’s and their volunteers devote countless hours of their time to ensure that these rescued animals are happy and healthy. “Feeding the animals between 7 and 8 p.m. takes 60-90 minutes depending on what needs to be done that shift. We have different food for each species of animal that we have and we make sure that all of their areas and bedding are clean. Moreover, we always visually inspect each animal to see if there are any obvious signs for sickness or stress. Once it is dark, everyone gets safely in their stalls or coops and are secured against coyotes, racoons, and skunks. Po, our disabled pig is tucked in with a blanket and it all starts over again the next day,” Hanosh said. They believe that it is the duty of the people to lookout for these creatures since they cannot always look out for themselves. Humans are the superior race and instead of abusing this power, the Hanosh’s believe that people should use it to help the inferior species. “The sanctuary shall advocate the responsibilities human beings have to demonstrate love through protection and advocacy for our voiceless companions,” Hanosh said. The Hanosh’s can always use more volunteers at the sanctuary; keeping up with a non-profit organization is a tremendous amount of work and they appreciate all the help that they can get. “Volunteers serve a critical role at the sanctuary by providing care to our animal residents and opportunities for education, healing, and encouragement for the general public through our events and visitor days. Because we are a non-profit, we are funded through donations. We, the founders, do not get paid, but we do have one part-time staff member who helps 20 hours a week. Volunteers helping with the rest of the chores ensures that more money of every dollar donated goes directly to the animals’ daily care and our emergency medical fund rather than high staffing costs,” Hanosh said. 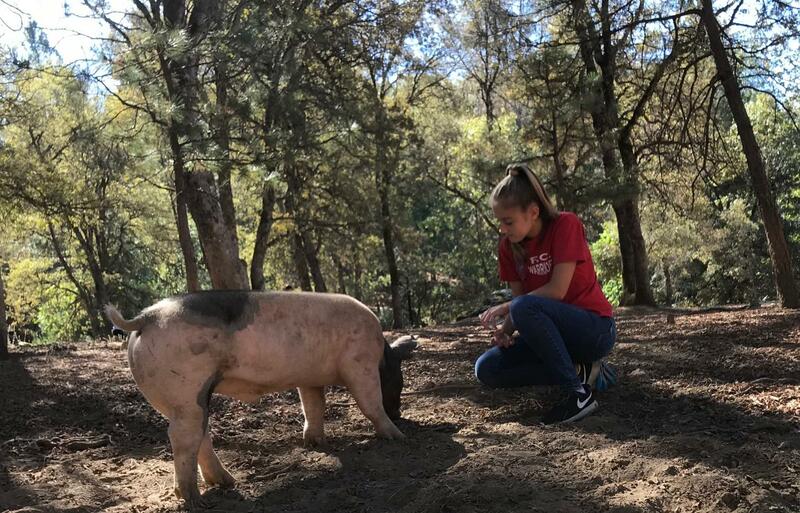 Blackberry Creek Farm Animal Sanctuary creates many opportunities for people, especially students to give back to animals that have been mistreated by the food industry. They believe that younger volunteers have specific qualities which benefit the development of Blackberry Creek and help spread the message of love and equality. “Student volunteers bring the unique perspective of a young generation and form special bonds with the animals at the sanctuary. Not only does their participation directly improve the well-being of our residents, but students themselves have the chance to learn about hard work, responsibility, empathy, healthy/compassionate eating, animal care and respect of others. We hope the sanctuary encourages a love of animals, the outdoors and lifelong volunteerism,” Hanosh said. Volunteers help and support the sanctuary, but the animals are not the only ones who benefit from this experience. The student volunteers are greatly impacted by the animals at Blackberry Creek and the chance to volunteer for a bigger cause. “By working with the animals at Blackberry Creek, I have gained so much knowledge and compassion and I really understand that animals have feelings too, and they deserve the same respect that we give each other. Their stories have impacted my life by making me appreciate what we have and are given because the animals have had tough experiences in their lives,” Kirsten Ransford said. Not only does the act of volunteering affect students, but the experience of doing something meaningful with their time gives them a new perspective. “I think it is important for students to volunteer for a meaningful cause because it can widen their outlook on life, no matter the place that they are volunteering. Students can be taught valuable lessons while becoming more patient and compassionate towards certain causes or ideas,” Grace Pierce said. Students interested in volunteering can find more information on their website www.blackberrycreek.org, or by following them on instagram @blackberrycreek. They host many volunteer days and a few big events, such as Christmas at Blackberry Creek, for anyone who wants to give back to the animals and support this organization.